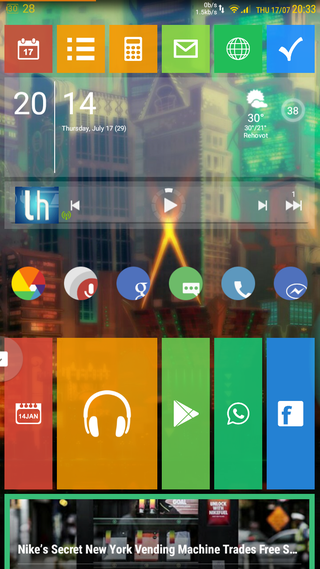 Dont like themer that much as it feels like somehow its a mock UI, something about the themes feels distancing and less direct, maybe artificial, cant seem to quite put in to words but it doesnt feel like a proper launcher. And I have had enough of the basic adroid launcher look so I went for the Win 8 tiles style to mix things up. -Launcher 8 pro (or free ), set to 6 tiles width, default is 4. -Wallpaper is from the "Transistor" game, google image search. - "Tinted status bar" module for Xposed for the yellow font in status bar.